What is Pleuritis or Pleurisy? Pleuritis is the term for inflammation of the pleura, the double layered lining around the lungs. Although the term pleuritis and pleurisy is used synonymously, pleurisy actually refers to any pain from the pleura (pleuritic pain). The outer pleural layer is known as the parietal pleura and lines the inside of the chest cavity around the lung. The inner pleural layer is attached to the lungs and is known as the visceral pleura. The pleural cavity is the space between the two pleural layers and it contains approximately 10 to 20ml of thin serous fluid known as the pleural fluid. This serves as a lubricant when the two layers rub against each other during lung expansion and contraction in respiration. When the pleural lining is irritated, it swells, secretes larger amounts of pleural fluid and elicits pain, particularly the parietal pleura. The composition of the pleural fluid may change and depending on the cause, it can increase to an extent that affects the expansion of the lungs during respiration. This excess pleural fluid is known as a pleural effusion, or simply fluid around the lungs. This should be differentiated from fluid in the lungs which is pulmonary edema. The close proximity to other structures and organs in the chest cavity means that pleurisy may arise secondary to various other conditions, especially those that affect the heart and its lining (pericardium). Pleurisy is more often associated with chest pain that is described as a sharp stabbing pain. It may exacerbate during breathing and coughing. The nature of pain in pleurisy is described further under pleuritic pain. Depending on the part of the pleura that is irritated, the pain may refer to the neck, shoulder or upper abdomen. Pleural effusion which is the fluid around the lungs. Shortness of breath as a result of shallow inhalation due to pain, restricted expansion of the lung due to a pleural effusion, or pathology of the air sacs in the lung which is associated with pleural involvement. Dry cough although a productive cough may be seen with bronchitis and pneumonia. Fever with infectious causes, certain autoimmune diseases and sometimes with malignancies. Pleural frictional rub is the sound similar to stiff leather creaking which is seen with pleuritis and is most prominent in fibrinous pleuritis. It is known as a pleuro-pericardial rub if it is only audible near the pericardium during deep inspiration. Read more on pericardial frictional rub under pericarditis symptoms. Pain emanating from the pleura is a common feature of most pleural disorders, even conditions that do not cause pleural inflammation (pleuritis). When the pleura are inflamed and rub against each other, it elicits pain. 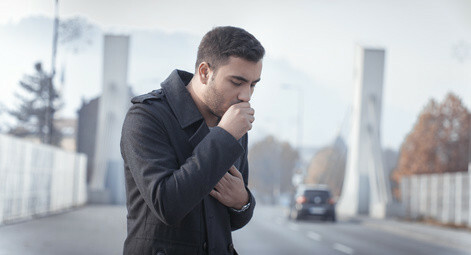 Pleuritic pain is described as a sharp stabbing that is most prominent during inhalation, deep breathing and coughing. Pleuritic pain is often thought of as chest wall pain that is exacerbated during inhalation. However, the pain may radiate or refer to surrounding areas. If the parietal pleura lying in the area of the upper six ribs is inflamed, it causes localized pain (upper chest pain). When the pleura behind the lower ribs and outer parts of the diaphragm are inflamed, the pain may be referred to the upper abdomen. Inflammation of the pleura around the central diaphragm may refer pain to the neck or shoulder tip due to the course of the phrenic nerve. Pleural disorders presenting with an effusion (fluid around the lungs) is less likely to cause this typical pain given that there is sufficient lubrication between the two pleural layers. However pain is a feature of the the inflammatory process and may still be present with a pleural effusion although the aggravation associated with breathing and coughing may not be as prominent. The most common cause of pleuritis is a viral infection.While it may arise with viral infections of surrounding areas or even systemic infections, viral pleuritis is often seen in outbreaks caused by the coxsackie B virus. It tends to affect adolescents and young adults and is a self limiting infection that resolves with just supportive treatment. Other common causes of pleuritis is often related to infection of the lungs as is seen with pneumonia and tuberculosis. Spread to the pleura may not always occur but is usually seen as the disease progresses. A lung abscess or empyema (pus within the pleural cavity) may also involve the pleura. Infection may also spread from the pericardium in infectious pericarditis. Trauma to the chest, exposure to radiation in the treatment of pulmonary and mediastinal cancers and hypersensitivity to certain drugs may cause pleuritis. This is similar to the causes of pericarditis and it is not uncommon for both the pleura and pericardium to be affected simultaneously. Other non-infectious conditions that may affect the lung and also involve the pleura includes bronchiectasis (non-infectious causes), lung infarcts and pulmonary embolism. Pleuritis may also be seen with a spontaneous pneumothorax. Non-infectious causes may also include systemic conditions and connective tissue diseases like rheumatoid arthritis, systemic lupus erythematosus (SLE) and uremia. Primary malignant tumor of the pleura is known as a mesothelioma and is often associated with asbestos exposure. Tumors of the lung or bronchi, mediastinum and secondary spread from distant site (matastases) may involve the pleura. Last updated on August 11, 2018.